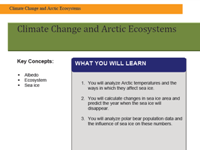 In this activity, students learn about how climate change is affecting the Arctic ecosystem and then investigate how this change is impacting polar bear populations. Students analyze maps of Arctic sea ice, temperature graphs, and polar bear population data to answer questions about the impact of climate change on the Arctic ecosystem. Questions at the beginning seem odd in their placement, but could be used as a pre-test. Educator should enlarge and laminate the map of the Arctic for use in the activity to improve readability. Educators should project the given images and go through the process of calculating percentage of sea ice cover with students. Good background readings for students are provided. Activity is very current and has scientifically-rich resources. In preparation for this lesson, educators should make sure they understand the difference between temperature anomalies or change in temperature from some mean temperature - usually a 30-year average. Comment from scientist: Some of the numbers on the web page are somewhat outdated. Educator should check for most up-to-date numbers on: http://pbsg.npolar.no/en/. Comment from scientist: Page 3 states that the central part of the Arctic is frozen all year - this is no longer true. This is a best practice lesson in its layout format, which takes the learner from engaging their thinking and making predictions, to exploring and explaining concepts, to extending their thinking, and finally to applying knowledge and reflecting. Group work and discussions are good strategies for students of different learning styles. Scaffolding of concepts is appropriate for the lesson and promotes the learning. The lesson ends with a good performance assessment (concept mapping) to evaluate student understanding. Links to a PowerPoint and concept map are included in the Teaching Tips section. The activity is nicely organized and has an attractive format that will engage students.